Furman math professors, from left, Kevin Hutson, John Harris ’91 and Liz Bouzarth began their work with ESPN senior writer Peter Keating. 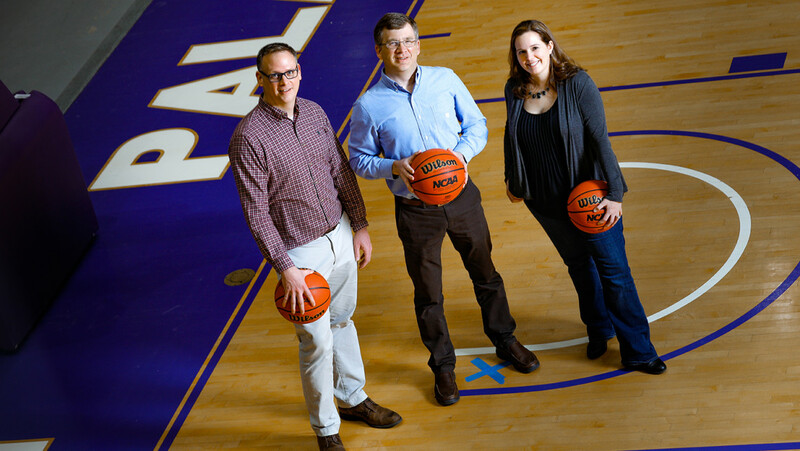 GREENVILLE, SC (courtesy furman.edu) — Since they began working with ESPN senior writer Peter Keating six years ago, Furman math professors Kevin Hutson, Liz Bouzarth and John Harris ’91 have gotten pretty good at predicting upsets in the NCAA Division I men’s basketball tournament. SCICU honored Hutson in 2016 as Furman’s Excellence In Teaching award recipient. In 2018, for example, their top upset picks – defined at a team seeded at least five spots lower than its opponent – were No. 11 Loyola over No. 6 Miami and No. 9 Florida State over No. 1 Xavier. Loyola and FSU both won. In 2017, their models actually had No. 11 Xavier favored over Maryland, and, sure enough, the Musketeers were victorious. The year before, their top four most likely first-round upsets all ended up being just that. So when the trio says that this time around they’ve combined all of the successful features of their past models into one, you may definitely want to pay attention before filling out your office bracket. The team with the most to fear according to their calculations is No. 6 Iowa State, which has a 50-percent chance of being beaten by No. 11 Ohio State. Another 11 seed, St. Mary’s, is given almost as good of a shot (46 percent) to knock off Villanova. Other games to watch are the Belmont/Temple winner against Maryland, Murray State and Marquette, and Liberty versus Mississippi State. The professors gave Maryland-Baltimore County a less than 4 percent chance to defeat Virginia last year in the first round, but of course the Retrievers pulled off the greatest upset in tournament history when they became the first 16 to beat a 1 (prior to that No. 1 seeds were 132-0 against 16s). Virginia is seeded first again in 2019, and Bouzarth says the Cavaliers have by far the best chance of all of the No. 1s to be upset, with their models giving No. 16 Gardner-Webb a nearly 10-percent chance of victory. Keating relied heavily on their models when he was writing his “Giant Killers” column for ESPN, but this year, while they’re still collaborating, there is no formal relationship between the network and the Furman math professors. Which could end up being a good thing for the university. They were all hoping to be predicting Furman’s chances at an upset in this year’s tournament, but a historic season wasn’t enough to land the Paladins a spot in the 68-team field for the first time since 1980. Their computer rankings had Furman 66th. They do, however, give the Paladins a good chance Wednesday night when they host Wichita State in the first round of the NIT.